Right on, I love historic clips... oh the design, the illustration, the orwellian concepts, but especially when they are so right on topic. This is hysterical, though I must admit that perhaps it's because I'm a such a big democratized / decentralized media geek. 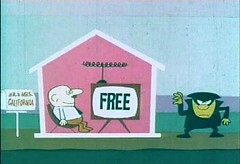 Anyway, it is my pleasure to bring you "Keep TV Free" a commercial from 1967. Reblogged from: Stay Free! Daily: Keep TV Free? Gee, who would have thought that some of the same suits who are now trying to dictate what you can watch and record on television once urged Americans to "Keep TV Free"? Well, here's a PSA from the late 1960s Hollywood that does just that. In 1967, when one of the first pay TV services was preparing to launch in California, Hollywood and the networks helped defeat the service because they didn't want the competition. Theater owners organized a KEEP TV FREE campaign, with PSAs like this one running in movie houses before feature films. Though this particular campaign was limited to California, the advertising industry and television networks have long argued a similar case. When Vance Packard, Ralph Nader, Peggy Charren, and other critics attacked advertising in the 1950s, 1970s, and 1980s (respectively), defenders of industry often cited a common refrain: "advertising provides free news and entertainment." In other words, the major networks (in conjunction with the ad industry) have promoted the idea that television is free for decades. Now that viewers have taken their word for it by recording and sharing TV shows freely, the industry has only itself to blame.